"A significant portrayal of Audrey Faye Hendricks and the Children’s March." "Levinson returns to the subject of We’ve Got a Job as she recounts, for a younger audience, the story of Audrey Faye Hendricks and her role in the 1963 Children’s March in Birmingham, Ala. Moving briskly through events, Levinson explains how the young Hendricks was eager to stand up to segregation, marching alongside thousands of fellow students, who were subsequently arrested. Newton’s bright, digitally assembled collages adeptly highlight the danger of the situation—grim cells, barbed-wire fences, children blasted with fire hoses—while emphasizing the power of the marchers’ collective efforts to push back against injustice." "Audrey’s third-person perspective is well represented and storytold, with short, punchy sentences especially vivid in conveying individual testimony and movement goals." "It's one of the more shocking and little-known stories of the civil rights movement: In 1963, the City of Birmingham jailed hundreds of kids for joining the Children's March. Among them was 7-year-old Audrey Faye Hendricks, taken from her family to spend a week behind bars, eating "oily grits" and sleeping on a bare mattress. Levinson and Newton keep her story bright and snappy, emphasizing the girl's eagerness to make a difference and her proud place in her community." "[This book] can introduce even the youngest children to the idea of rebellion in an age-appropriate and inspiring way. Give the princesses and pirates a rest and try these inspiring reads—just don’t be surprised if bedtime negotiations rise to a new level. Every activist has to start somewhere!.... The book tells the true story of Audrey Faye Hendricks, who was arrested at a civil rights protest in Birmingham, Ala., when she was 9 years old. In it, Audrey is introduced to stories about the Ku Klux Klan and police brutality, and she decides to join the protest. The compelling story about white supremacy and the civil rights era illustrates the courage and personal sacrifice that activism requires, and teaches kids why it matters." "Levinson tells the true story of Audrey Faye Hendricks, the youngest participant in the 1963 Birmingham Children's March.... The well-paced text captures a child's voice and presents time and place realistically. Brightly colored digital collages clearly depict both the hopeful spirit and the rawer emotions of one community involved in the civil rights struggle; a double-page spread of Audrey curled up on a bare mattress in her jail cell is particularly effective." "Having honest and open discussions about race, tolerance, and acceptance from a very early age can set the stage for a much broader and deeper understanding of these issues as your child grows. Here [is a book] that can help spark these conversations.... 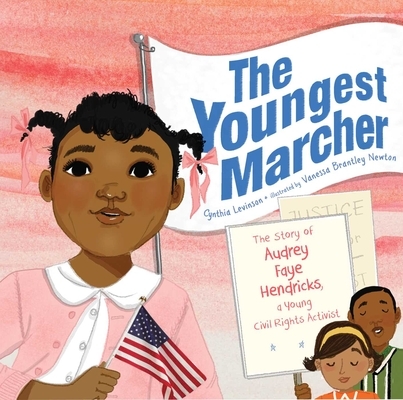 The story of the youngest known civil rights protester in history will teach children that you’re never too small to stand up for what you believe in."